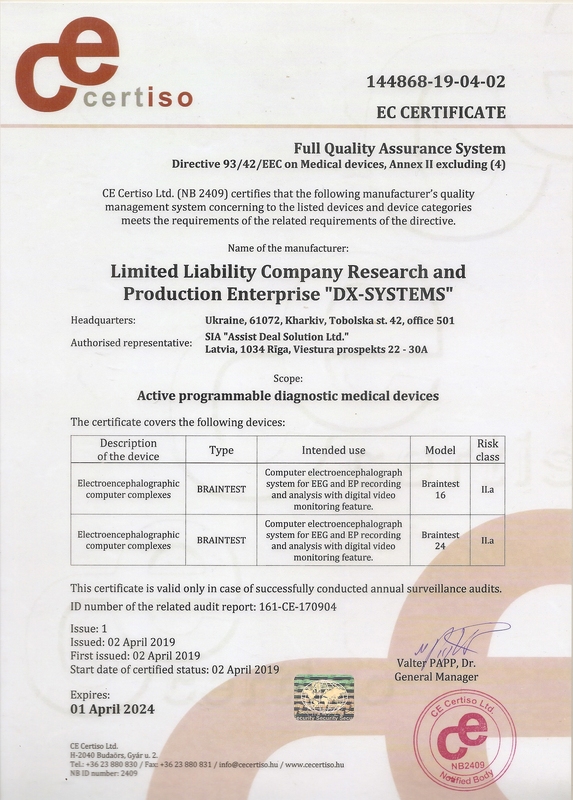 «DX-Systems» is a Ukrainian company, which for 18 years has been developing, producing, selling and maintaining medical equipment for diagnosing vital body functions – brain electrical activity and the state of cardiovascular and neuromuscular systems. The equipment we produce is designed to serve the needs of a wide range of professionals. Our equipment is not only for working doctors, we offer the systems that would suit research workers or medical teachers. For any medical institution, including a rehabilitation, sports or prophylactic establishment, there will be a device to cover their specific needs. It is common knowledge that medical organisations prefer to buy medical equipment produced by well-established international manufacturers. Therefore, sharing a market with such companies as Nikolet and Nihon Kohden is far from being easy. It is possible and interesting, though. The three pillars we lean on are as follows: the use of advanced technologies, high-quality products and well-organised interaction with our users. For those reasons our equipment is more available price and servicewise, being on a par with reknowned brands in terms of functionality. It is possible to customise the equipment to meet the requirements of an organisation, its unit or doctor. Individual approach and long-term coopeartion are among our priorities when working with a customer. Users feedback is taken into account when new versions of software are developed. We believe, there will be no development without device improvement, even though it takes up a considerable amount of company’s resources. Striving to be up to speed with market needs we are constantly improving our equipment, refining the software, the hardware and the electrode systems of the whole range of our products, also adding new devices. The team is the biggest value we have. Our team is friendly, keeping to its traditions and pronciples. There are several philosophical principles we share. One of the key things we all believe is that “win-win” is the best choice under any conditions. No matter what situations we have to deal with, there will always be a “win-win” arrangement between us and our partners, dealers, users and even competitors. This regards anything, including finance. Such an approach has always worked well and helped us build highly effective relations with all the parties we have to deal with. We are the team of like-minded people. There is a unifying aim – to help people by producing the equipment they need. There are common interests – we are fond of nature and sports. Going to the gym, jogging in any weather and a weekend outdoors is trendy with us. Extreme hobbies, like winter trekking trips and icy water dipping also stand high. On top of that, we fancy guitar singing and playing, amateur staging during in-house events and, as a result, we get positive and productive spirits! All that creates a team ready to face challenges. Planning to use or supply diagnostics equipment? Our team is at your service – ready to establish contacts and cooperate! We would also like to express our sincere gratitude to the doctors who have been using our equipment for work and research.